Background: Colchicine, a tricyclic alkaloid, is commonly used in treatment due to its antiinflammatory and anti-fibrotic effects. Besides its toxicity at high doses, colchicine is reported for its potential anticancer effects at lower concentrations. The present study aimed to evaluate the anticancer effects of colchicine in SW480 cells. Methods: The effect of colchicine on cell proliferation was determined by MTT assay. The cellular colchicine uptake was measured by HPLC analysis. The apoptotic effects was evaluated by annexin v binding assay and MMP-9 mRNA expression was determined by RT-PCR experiments. Results: Colchicine showed significant cytotoxicity at 10 ng/ml and higher concentrations and caused a cell cycle arrest of SW480 cells at G2/M phase. The results of HPLC analysis showed that colchicine uptake was increased in correlation with treated concentrations. Colchicine concentrations have increased the amount of apoptotic cell population. The elisa and western blot measurements showed that colchicine led to nuclear translocation of NF-κB proteins and increased caspase levels. The real time PCR experiments showed that colchicine has inhibitory effect on MMP-9 mRNA expression in a concentration dependent manner. 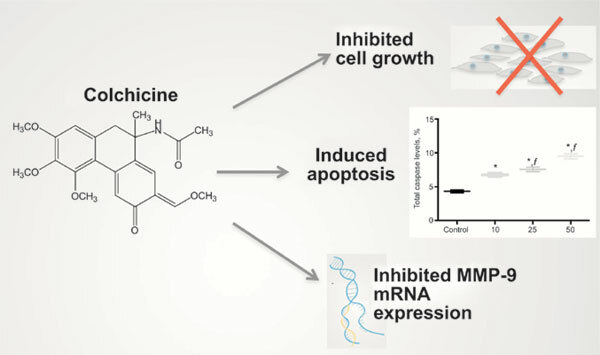 Conclusion: These results illustrated that low dose colchicine efficiently induced cell death and apoptosis of SW480 cells and the inhibition of MMP-9 mRNA levels was significantly correlated with the amount of cellular colchicine uptake, suggesting that colchicine has a potential value in the treatment of human colorectal cancer. Colchicine, cellular uptake, cytotoxicity, SW480, apoptosis, cell cycle, MMP-9.